PT TUNAS WIRAJAYA, Untuk memenuhi kebutuhan peralatan listrik yang digunakan di area berbahaya karena adanya gas dan debu yang mudah terbakar seperti di Perusahaan Pengeboran minyak, Refinery unit, Perusahaan Pendistribusian oil, pabrik kimia (Chemical), Petrochemical, Pabrik Cat, Painting area, Pabrik Pengecatan barang, Pertambangan Batu Bara, Pabrik Pupuk, Pabrik Pakan Ternak, dll. Kami sebagai distributor peralatan listrik Explosion Proof menyediakan dan siap memberikan solusinya, antara lain : Explosion Proof LED Lighting, Explosion Proof Junction Box, Explosion Proof Lighting Fixture, Explosion Proof Air Conditioner (AC), Explosion Proof Blower, Explosion proof Axial Fan, Explosion proof Portable blower, Explosion Proof Cable Glands, Explosion Proof Torch Light, Explosion Proof Push-button, Senter Explosion proof, Explosion Proof Switches, Lampu sorot Explosion proof, Lampu Explosion proof warning light, Explosion Proof Plugs and sockets outlet, Explosion Proof Hand Lamp, Explosion Proof Alarm Light, Lampu tembak explosion proof, Explosion Proof Load Center, Explosion Proof Portable Lighting, Explosion Proof Floodlight, etc. PT TUNAS WIRAJAYA Distributor agen lampu 2x36watt 1x36watt 2x18watt 1x18watt Lighting fixture explosion proof gasproof lampu 2x36watt 1x36watt 2x18watt 1x18watt Lighting fixture explosion proof gasproof lampu 2x36watt 1x36watt 2x18watt 1x18watt Lighting fixture explosion proof lampu 2x36watt 1x36watt 2x18watt 1x18watt Lighting fixture alumunium explosion proof lampu 2x36watt 1x36watt 2x18watt 1x18watt Technor Marechal Italsmea Lighting fixture explosion proof Merk HRLM EEW Warom FPFB cz supermec LGEXT DYNAMIN Palazzoli Tormin Palazzoli KHJ lampu 2x36watt 1x36watt 2x18watt 1x18watt Lighting fixture explosion proof gasproof lampu 2x36watt 1x36watt 2x18watt 1x18watt Lighting fixture explosion proof stainless steel 316 explosion proof Merk HRLM supermec EEW Warom FPFB cz LGEXT DYNAMIN Palazzoli Tormin Palazzoli KHJ explosion proof gasproof lampu 2x36watt 1x36watt 2x18watt 1x18watt Lighting fixture stainless steel 304 lampu 2x36watt 1x36watt 2x18watt 1x18watt Lighting fixture explosion proof zone 1 explosion proof lampu 2x36watt 1x36watt 2x18watt 1x18watt Lighting fixture zone 2 explosion proof lampu 2x36watt 1x36watt 2x18watt 1x18watt Lighting fixture explosion proof lampu 2x36watt 1x36watt 2x18watt 1x18watt Lighting fixture pemasaran area Jakarta explosion proof lampu Technor Marechal Italsmea 2x36watt 1x36watt 2x18watt 1x18watt Lighting fixture semarang explosion proof lampu 2x36watt 1x36watt 2x18watt 1x18watt Lighting fixture cilacap explosion proof lampu 2x36watt 1x36watt 2x18watt 1x18watt Lighting fixture surabaya explosion proof lampu 2x36watt 1x36watt 2x18watt 1x18watt Lighting fixture menado explosion proof lampu Technor Marechal Italsmea 2x36watt 1x36watt 2x18watt 1x18watt Lighting fixture balikpapan Merk HRLM supermec EEW Warom FPFB cz LGEXT DYNAMIN Palazzoli Tormin Palazzoli KHJ explosion proof lampu 2x36watt 1x36watt 2x18watt 1x18watt Lighting fixture riau explosion proof gasproof lampu 2x36watt 1x36watt 2x18watt 1x18watt Lighting fixture Palembang explosion proof lampu 2x36watt 1x36watt 2x18watt 1x18watt Lighting fixture Bandung Exd flame proof lampu 2x36watt 1x36watt 2x18watt 1x18watt Technor Marechal Italsmea Lighting fixture indonesia lampu 2x36watt 1x36watt 2x18watt 1x18watt Lighting fixture explosion proof lampu 2x36watt 1x36watt 2x18watt 1x18watt Lighting fixture explosion proof lampu 2x36watt 1x36watt 2x18watt 1x18watt Lighting fixture explosion proof explosion proof lampu 2x36watt 1x36watt 2x18watt 1x18watt Lighting fixture explosion proof lampu 2x36watt 1x36watt 2x18watt 1x18watt Lighting fixture explosion proof lampu 2x36watt 1x36watt 2x18watt 1x18watt Lighting fixture explosion proof lampu 2x36watt 1x36watt 2x18watt 1x18watt Lighting fixture explosion proof gasproof explosion proof gasproof lampu 2x36watt 1x36watt 2x18watt 1x18watt Lighting fixture in plastic GRP lampu 2x36watt 1x36watt 2x18watt 1x18watt Lighting fixture explosion proof plastik material Merk HRLM EEW Warom FPFB cz supermec LGEXT DYNAMIN Palazzoli Tormin Palazzoli supermec KHJ BPY BHY BYS BAY52 BAY BAY51 Palazzoli 820202EX 820232EX Rino series Distributor agen lampu 2x36watt 1x36watt 2x18watt 1x18watt Lighting fixture explosion proof lampu 2x36watt 1x36watt 2x18watt 1x18watt Lighting fixture explosion proof lampu 2x36watt 1x36watt 2x18watt 1x18watt Lighting fixture explosion proof lampu 2x36watt 1x36watt 2x18watt 1x18watt Lighting fixture alumunium explosion proof lampu 2x36watt 1x36watt 2x18watt 1x18watt Lighting fixture GRP explosion proof, lampu explosion proof TL 2x36 watt rata plafon untuk penerangan laboratorium, pabrik kimia, lampu lab, dll. PT TUNAS WIRAJAYA, Untuk memenuhi kebutuhan peralatan listrik yang digunakan di area berbahaya karena adanya gas dan debu yang mudah terbakar seperti di Perusahaan Pengeboran minyak, Refinery unit, Perusahaan Pendistribusian oil, pabrik kimia (Chemical), Petrochemical, Pabrik Cat, Painting area, Pabrik Pengecatan barang, Pertambangan Batu Bara, Pabrik Pupuk, Pabrik Pakan Ternak, dll. Kami sebagai distributor peralatan listrik Explosion Proof menyediakan dan siap memberikan solusinya, antara lain : Explosion Proof LED Lighting, Explosion Proof Junction Box, Explosion Proof Lighting Fixture, Explosion Proof Air Conditioner (AC), Explosion Proof Blower, Explosion proof Axial Fan, Explosion proof Portable blower, Explosion Proof Cable Glands, Explosion Proof Torch Light, Explosion Proof Push-button, Senter Explosion proof, Explosion Proof Switches, Lampu sorot Explosion proof, Lampu Explosion proof warning light, Explosion Proof Plugs and sockets outlet, Explosion Proof Hand Lamp, Explosion Proof Alarm Light, Lampu tembak explosion proof, Explosion Proof Load Center, Explosion Proof Portable Lighting, Explosion Proof Floodlight, etc. PT TUNAS WIRAJAYA Distributor agen lampu 2x36watt 1x36watt 2x18watt 1x18watt Lighting fixture explosion proof gasproof lampu 2x36watt 1x36watt 2x18watt 1x18watt Lighting fixture explosion proof gasproof lampu 2x36watt 1x36watt 2x18watt 1x18watt Lighting fixture explosion proof lampu 2x36watt 1x36watt 2x18watt 1x18watt Lighting fixture alumunium explosion proof lampu 2x36watt 1x36watt 2x18watt 1x18watt Technor Marechal Italsmea Lighting fixture explosion proof Merk HRLM EEW Warom FPFB cz supermec LGEXT DYNAMIN Palazzoli Tormin Palazzoli KHJ lampu 2x36watt 1x36watt 2x18watt 1x18watt Lighting fixture explosion proof gasproof lampu 2x36watt 1x36watt 2x18watt 1x18watt Lighting fixture explosion proof stainless steel 316 explosion proof Merk HRLM supermec EEW Warom FPFB cz LGEXT DYNAMIN Palazzoli Tormin Palazzoli KHJ explosion proof gasproof lampu 2x36watt 1x36watt 2x18watt 1x18watt Lighting fixture stainless steel 304 lampu 2x36watt 1x36watt 2x18watt 1x18watt Lighting fixture explosion proof zone 1 explosion proof lampu 2x36watt 1x36watt 2x18watt 1x18watt Lighting fixture zone 2 explosion proof lampu 2x36watt 1x36watt 2x18watt 1x18watt Lighting fixture explosion proof lampu 2x36watt 1x36watt 2x18watt 1x18watt Lighting fixture pemasaran area Jakarta explosion proof lampu Technor Marechal Italsmea 2x36watt 1x36watt 2x18watt 1x18watt Lighting fixture semarang explosion proof lampu 2x36watt 1x36watt 2x18watt 1x18watt Lighting fixture cilacap explosion proof lampu 2x36watt 1x36watt 2x18watt 1x18watt Lighting fixture surabaya explosion proof lampu 2x36watt 1x36watt 2x18watt 1x18watt Lighting fixture menado explosion proof lampu Technor Marechal Italsmea 2x36watt 1x36watt 2x18watt 1x18watt Lighting fixture balikpapan Merk HRLM supermec EEW Warom FPFB cz LGEXT DYNAMIN Palazzoli Tormin Palazzoli KHJ explosion proof lampu 2x36watt 1x36watt 2x18watt 1x18watt Lighting fixture riau explosion proof gasproof lampu 2x36watt 1x36watt 2x18watt 1x18watt Lighting fixture Palembang explosion proof lampu 2x36watt 1x36watt 2x18watt 1x18watt Lighting fixture Bandung Exd flame proof lampu 2x36watt 1x36watt 2x18watt 1x18watt Technor Marechal Italsmea Lighting fixture indonesia lampu 2x36watt 1x36watt 2x18watt 1x18watt Lighting fixture explosion proof lampu 2x36watt 1x36watt 2x18watt 1x18watt Lighting fixture explosion proof lampu 2x36watt 1x36watt 2x18watt 1x18watt Lighting fixture explosion proof explosion proof lampu 2x36watt 1x36watt 2x18watt 1x18watt Lighting fixture explosion proof lampu 2x36watt 1x36watt 2x18watt 1x18watt Lighting fixture explosion proof lampu 2x36watt 1x36watt 2x18watt 1x18watt Lighting fixture explosion proof lampu 2x36watt 1x36watt 2x18watt 1x18watt Lighting fixture explosion proof gasproof explosion proof gasproof lampu 2x36watt 1x36watt 2x18watt 1x18watt Lighting fixture in plastic GRP lampu 2x36watt 1x36watt 2x18watt 1x18watt Lighting fixture explosion proof plastik material Merk HRLM EEW Warom FPFB cz supermec LGEXT DYNAMIN Palazzoli Tormin Palazzoli supermec KHJ BPY BHY BYS BAY52 BAY BAY51 Palazzoli 820202EX 820232EX Rino series Distributor agen lampu 2x36watt 1x36watt 2x18watt 1x18watt Lighting fixture explosion proof lampu 2x36watt 1x36watt 2x18watt 1x18watt Lighting fixture explosion proof lampu 2x36watt 1x36watt 2x18watt 1x18watt Lighting fixture explosion proof lampu 2x36watt 1x36watt 2x18watt 1x18watt Lighting fixture alumunium explosion proof lampu 2x36watt 1x36watt 2x18watt 1x18watt Lighting fixture GRP explosion proof, lampu explosion proof TL 2x36 watt rata plafon untuk penerangan laboratorium, pabrik kimia, lampu lab, dll. PT TUNAS WIRAJAYA, Untuk memenuhi kebutuhan peralatan listrik yang digunakan di area berbahaya karena adanya gas dan debu yang mudah terbakar seperti di Perusahaan Pengeboran minyak, Refinery unit, Perusahaan Pendistribusian oil, pabrik kimia (Chemical), Petrochemical, Pabrik Cat, Painting area, Pabrik Pengecatan barang, Pertambangan Batu Bara, Pabrik Pupuk, Pabrik Pakan Ternak, dll. Kami sebagai distributor peralatan listrik Explosion Proof menyediakan dan siap memberikan solusinya, antara lain : Explosion Proof LED Lighting, Explosion Proof Junction Box, Explosion Proof Lighting Fixture, Explosion Proof Air Conditioner (AC), Explosion Proof Blower, Explosion proof Axial Fan, Explosion proof Portable blower, Explosion Proof Cable Glands, Explosion Proof Torch Light, Explosion Proof Push-button, Senter Explosion proof, Explosion Proof Switches, Lampu sorot Explosion proof, Lampu Explosion proof warning light, Explosion Proof Plugs and sockets outlet, Explosion Proof Hand Lamp, Explosion Proof Alarm Light, Lampu tembak explosion proof, Explosion Proof Load Center, Explosion Proof Portable Lighting, Explosion Proof Floodlight, etc. PT TUNAS WIRAJAYA Distributor agen lampu 2x36watt 1x36watt 2x18watt 1x18watt Lighting fixture explosion proof gasproof lampu 2x36watt 1x36watt 2x18watt 1x18watt Lighting fixture explosion proof gasproof lampu 2x36watt 1x36watt 2x18watt 1x18watt Lighting fixture explosion proof lampu 2x36watt 1x36watt 2x18watt 1x18watt Lighting fixture alumunium explosion proof lampu 2x36watt 1x36watt 2x18watt 1x18watt Technor Marechal Italsmea Lighting fixture explosion proof Merk HRLM EEW Warom FPFB cz supermec LGEXT DYNAMIN Palazzoli Tormin Palazzoli KHJ lampu 2x36watt 1x36watt 2x18watt 1x18watt Lighting fixture explosion proof gasproof lampu 2x36watt 1x36watt 2x18watt 1x18watt Lighting fixture explosion proof stainless steel 316 explosion proof Merk HRLM supermec EEW Warom FPFB cz LGEXT DYNAMIN Palazzoli Tormin Palazzoli KHJ explosion proof gasproof lampu 2x36watt 1x36watt 2x18watt 1x18watt Lighting fixture stainless steel 304 lampu 2x36watt 1x36watt 2x18watt 1x18watt Lighting fixture explosion proof zone 1 explosion proof lampu 2x36watt 1x36watt 2x18watt 1x18watt Lighting fixture zone 2 explosion proof lampu 2x36watt 1x36watt 2x18watt 1x18watt Lighting fixture explosion proof lampu 2x36watt 1x36watt 2x18watt 1x18watt Lighting fixture pemasaran area Jakarta explosion proof lampu Technor Marechal Italsmea 2x36watt 1x36watt 2x18watt 1x18watt Lighting fixture semarang explosion proof lampu 2x36watt 1x36watt 2x18watt 1x18watt Lighting fixture cilacap explosion proof lampu 2x36watt 1x36watt 2x18watt 1x18watt Lighting fixture surabaya explosion proof lampu 2x36watt 1x36watt 2x18watt 1x18watt Lighting fixture menado explosion proof lampu Technor Marechal Italsmea 2x36watt 1x36watt 2x18watt 1x18watt Lighting fixture balikpapan Merk HRLM supermec EEW Warom FPFB cz LGEXT DYNAMIN Palazzoli Tormin Palazzoli KHJ explosion proof lampu 2x36watt 1x36watt 2x18watt 1x18watt Lighting fixture riau explosion proof gasproof lampu 2x36watt 1x36watt 2x18watt 1x18watt Lighting fixture Palembang explosion proof lampu 2x36watt 1x36watt 2x18watt 1x18watt Lighting fixture Bandung Exd flame proof lampu 2x36watt 1x36watt 2x18watt 1x18watt Technor Marechal Italsmea Lighting fixture indonesia lampu 2x36watt 1x36watt 2x18watt 1x18watt Lighting fixture explosion proof lampu 2x36watt 1x36watt 2x18watt 1x18watt Lighting fixture explosion proof lampu 2x36watt 1x36watt 2x18watt 1x18watt Lighting fixture explosion proof explosion proof lampu 2x36watt 1x36watt 2x18watt 1x18watt Lighting fixture explosion proof lampu 2x36watt 1x36watt 2x18watt 1x18watt Lighting fixture explosion proof lampu 2x36watt 1x36watt 2x18watt 1x18watt Lighting fixture explosion proof lampu 2x36watt 1x36watt 2x18watt 1x18watt Lighting fixture explosion proof gasproof explosion proof gasproof lampu 2x36watt 1x36watt 2x18watt 1x18watt Lighting fixture in plastic GRP lampu 2x36watt 1x36watt 2x18watt 1x18watt Lighting fixture explosion proof plastik material Merk HRLM EEW Warom FPFB cz supermec LGEXT DYNAMIN Palazzoli Tormin Palazzoli supermec KHJ BPY BHY BYS BAY52 BAY BAY51 Palazzoli 820202EX 820232EX Rino series Distributor agen lampu 2x36watt 1x36watt 2x18watt 1x18watt Lighting fixture explosion proof lampu 2x36watt 1x36watt 2x18watt 1x18watt Lighting fixture explosion proof lampu 2x36watt 1x36watt 2x18watt 1x18watt Lighting fixture explosion proof lampu 2x36watt 1x36watt 2x18watt 1x18watt Lighting fixture alumunium explosion proof lampu 2x36watt 1x36watt 2x18watt 1x18watt Lighting fixture GRP explosion proof, lampu explosion proof TL 2x36 watt rata plafon untuk penerangan laboratorium, pabrik kimia, lampu lab, dll. distributor lampu TL 2x36 watt explosion proof di indonesia, explosion proof lampu TL 2x36 watt Indonesia, agen lampu explosion proof 2x36 watt di jakarta, distributor lampu explosion proof 2x36 watt di Indonesia. distributor lampu TL 2x36 watt explosion proof di indonesia, explosion proof lampu TL 2x36 watt Indonesia, agen lampu explosion proof 2x36 watt di jakarta, distributor lampu explosion proof 2x36 watt di Indonesia. distributor lampu TL 2x36 watt explosion proof di indonesia, explosion proof lampu TL 2x36 watt Indonesia, agen lampu explosion proof 2x36 watt di jakarta, distributor lampu explosion proof 2x36 watt di Indonesia. PT TUNAS WIRAJAYA, Untuk memenuhi kebutuhan peralatan listrik yang digunakan di area berbahaya karena adanya gas dan debu yang mudah terbakar seperti di Perusahaan Pengeboran minyak, Refinery unit, Perusahaan Pendistribusian oil, pabrik kimia (Chemical), Petrochemical, Pabrik Cat, Painting area, Pabrik Pengecatan barang, Pertambangan Batu Bara, Pabrik Pupuk, Pabrik Pakan Ternak, dll. Kami sebagai distributor peralatan listrik Explosion Proof menyediakan dan siap memberikan solusinya, antara lain : Explosion Proof LED Lighting, Explosion Proof Junction Box, Explosion Proof Lighting Fixture, Explosion Proof Air Conditioner (AC), Explosion Proof Blower, Explosion proof Axial Fan, Explosion proof Portable blower, Explosion Proof Cable Glands, Explosion Proof Torch Light, Explosion Proof Push-button, Senter Explosion proof, Explosion Proof Switches, Lampu sorot Explosion proof, Lampu Explosion proof warning light, Explosion Proof Plugs and sockets outlet, Explosion Proof Hand Lamp, Explosion Proof Alarm Light, Lampu tembak explosion proof, Explosion Proof Load Center, Explosion Proof Portable Lighting, Explosion Proof Floodlight, etc. 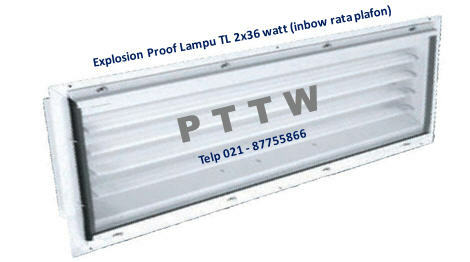 PT TUNAS WIRAJAYA Distributor agen lampu 2x36watt 1x36watt 2x18watt 1x18watt Lighting fixture explosion proof gasproof lampu 2x36watt 1x36watt 2x18watt 1x18watt Lighting fixture explosion proof gasproof lampu 2x36watt 1x36watt 2x18watt 1x18watt Lighting fixture explosion proof lampu 2x36watt 1x36watt 2x18watt 1x18watt Lighting fixture alumunium explosion proof lampu 2x36watt 1x36watt 2x18watt 1x18watt Technor Marechal Italsmea Lighting fixture explosion proof Merk HRLM EEW Warom FPFB cz supermec LGEXT DYNAMIN Palazzoli Tormin Palazzoli KHJ lampu 2x36watt 1x36watt 2x18watt 1x18watt Lighting fixture explosion proof gasproof lampu 2x36watt 1x36watt 2x18watt 1x18watt Lighting fixture explosion proof stainless steel 316 explosion proof Merk HRLM supermec EEW Warom FPFB cz LGEXT DYNAMIN Palazzoli Tormin Palazzoli KHJ explosion proof gasproof lampu 2x36watt 1x36watt 2x18watt 1x18watt Lighting fixture stainless steel 304 lampu 2x36watt 1x36watt 2x18watt 1x18watt Lighting fixture explosion proof zone 1 explosion proof lampu 2x36watt 1x36watt 2x18watt 1x18watt Lighting fixture zone 2 explosion proof lampu 2x36watt 1x36watt 2x18watt 1x18watt Lighting fixture explosion proof lampu 2x36watt 1x36watt 2x18watt 1x18watt Lighting fixture pemasaran area Jakarta explosion proof lampu Technor Marechal Italsmea 2x36watt 1x36watt 2x18watt 1x18watt Lighting fixture semarang explosion proof lampu 2x36watt 1x36watt 2x18watt 1x18watt Lighting fixture cilacap explosion proof lampu 2x36watt 1x36watt 2x18watt 1x18watt Lighting fixture surabaya explosion proof lampu 2x36watt 1x36watt 2x18watt 1x18watt Lighting fixture menado explosion proof lampu Technor Marechal Italsmea 2x36watt 1x36watt 2x18watt 1x18watt Lighting fixture balikpapan Merk HRLM supermec EEW Warom FPFB cz LGEXT DYNAMIN Palazzoli Tormin Palazzoli KHJ explosion proof lampu 2x36watt 1x36watt 2x18watt 1x18watt Lighting fixture riau explosion proof gasproof lampu 2x36watt 1x36watt 2x18watt 1x18watt Lighting fixture Palembang explosion proof lampu 2x36watt 1x36watt 2x18watt 1x18watt Lighting fixture Bandung Exd flame proof lampu 2x36watt 1x36watt 2x18watt 1x18watt Technor Marechal Italsmea Lighting fixture indonesia lampu 2x36watt 1x36watt 2x18watt 1x18watt Lighting fixture explosion proof lampu 2x36watt 1x36watt 2x18watt 1x18watt Lighting fixture explosion proof lampu 2x36watt 1x36watt 2x18watt 1x18watt Lighting fixture explosion proof explosion proof lampu 2x36watt 1x36watt 2x18watt 1x18watt Lighting fixture explosion proof lampu 2x36watt 1x36watt 2x18watt 1x18watt Lighting fixture explosion proof lampu 2x36watt 1x36watt 2x18watt 1x18watt Lighting fixture explosion proof lampu 2x36watt 1x36watt 2x18watt 1x18watt Lighting fixture explosion proof gasproof explosion proof gasproof lampu 2x36watt 1x36watt 2x18watt 1x18watt Lighting fixture in plastic GRP lampu 2x36watt 1x36watt 2x18watt 1x18watt Lighting fixture explosion proof plastik material Merk HRLM EEW Warom FPFB cz supermec LGEXT DYNAMIN Palazzoli Tormin Palazzoli supermec KHJ BPY BHY BYS BAY52 BAY BAY51 Palazzoli 820202EX 820232EX Rino series Distributor agen lampu 2x36watt 1x36watt 2x18watt 1x18watt Lighting fixture explosion proof lampu 2x36watt 1x36watt 2x18watt 1x18watt Lighting fixture explosion proof lampu 2x36watt 1x36watt 2x18watt 1x18watt Lighting fixture explosion proof lampu 2x36watt 1x36watt 2x18watt 1x18watt Lighting fixture alumunium explosion proof lampu 2x36watt 1x36watt 2x18watt 1x18watt Lighting fixture GRP explosion proof, lampu explosion proof TL 2x36 watt rata plafon untuk penerangan laboratorium, pabrik kimia, lampu lab, dll.